This small, attractive set replaced the MX 3500. It was fitted with a 21” wide-angle 45AX tube, an unusual fitment in a UK market television. The reason that the model number had changed was that the MX 4000 was fitted with a completely new version of the “unity” chassis, a name given to a range of designs that could be fitted to both the MX and the LX series. The new chassis was very similar in appearance to the old, but refinement of technique and repositioning of some parts (e.g. the power unit and timebases were now combined on one panel rather than being spread over two) meant that there was more room for further advanced features. The new sets had more powerful audio stages, more versatile signal routing options, standard Nicam stereo (on all UK models) and the choice of various upgrades, including picture-in-picture and satellite receiver (Beosat LM) modules. Later versions of the chassis were re-programmed to use the Beo 4 terminal instead of the Beolink 1000 and fitted with “improved teletext”, a system which stored all the receivable pages so that any one could be recalled instantly. “Beo 4” sets lost the two-way IR communication possibilities, so could not be used fully with the Beolink 5000 two-way terminal. Text copyright © Beocentral. Unauthorised reproduction prohibited. As one would expect from B&O, a full range of connection possibilities were offered to make for easy integration with the owner’s existing equipment. Included were two 21-pin AV connectors (with two-way Datalink and RGB inputs), an S-VHS connector (not used with other B&O equipment sold in Europe) and two Powerlink sockets for active loudspeakers. The latter were especially useful if the set was used as a link-room controller in a Beolink system. Text copyright © Beocentral. Unauthorised reproduction prohibited. The MX 4000 was the smallest set to be fitted with this new chassis, and was a popular and fast selling model. 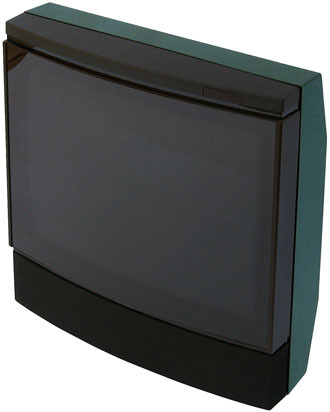 Its compact size meant that it was a viable alternative to a traditional portable set, offering the benefits of elegance, quality and versatility (it could be used as part of a Beolink system for example) that the cheaper types of television could not. To allow for freedom of positioning, various stands and brackets for floor, wall and table mounting could be purchased, some including a motorised turntable, which could be connected to the set and operated by remote control. A wide range of colours for the painted rear cabinet section were offered, though as with the previous versions of this set, black and white were the most popular. Text copyright © Beocentral. Unauthorised reproduction prohibited. After a very long production run and innumerable minor changes, the MX 4000 was replaced by the MX 4200. Text copyright © Beocentral. Unauthorised reproduction prohibited.